Let's Talk Shop with Russ. Plus a Giveaway !!!!! Hey folks I want to ask a favor. My Community forum admin and good friend Russ Claridy has a weekly live streaming show on YouTube. 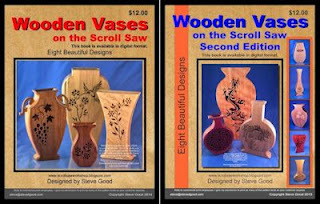 The discussion changes weekly but it revolves around woodworking. I would like to ask that you join us this Saturday night at 8pm Eastern time. I will be one of the panelist. This weeks guest speaker is James Wright. James is a hand tool enthusiast with a passions for the craft. 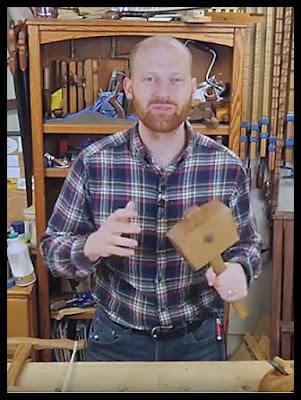 James runs a YouTube channel demonstrating different techniques and tools he uses. You will be able to join the chat room, ask questions and make comments. Here is the link to the show. Let's Talk Shop with Russ. Please visit the site and look for the "Upcoming Live Stream". As an incentive to attend I will be sharing a giveaway during the show. 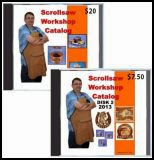 The prize will be a gross(144) of Flying Dutchman scroll saw blades. That's enough blades to get you through a bunch of projects. These are high quality blades. During the show I will announce a "Key Word". All you have to do to win is send an email to the email address announced during the show. I will randomly pick from the emails and send the lucky winner the blades. If technical reasons prevent the giveaway during the show I will announce the "Key Word" on my blog. The winner will be selected Sunday night, May 22, 2016. Entries must be in before 10pm of that day. Jame Wright Hand Tool Enthusiast. 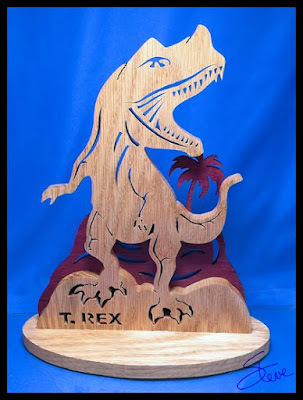 T. Rex Dinosaur Scroll Saw Pattern. This T. Rex is 10.25 inches tall. I cut this guy from 1/2" Red Oak. I seldom use Red Oak. It's not one of my favorite woods to use. The grain is so open that the blade has a tendency to the grain. If you cut Red Oak make sure you keep the blade nice and sharp. The sharper it is the less likely you will be to have trouble. The original graphic was from vectorportal.com. I modified it quite a bit so it could be cut on the scroll saw. A reminder to email newsletter subscribers. The newsletter is just a copy of the daily blog post. If you ever miss or lose an email you can visit the blog and find the same content. I cannot resend the email newsletter because that is an automatic service.